The accident at the Chernobyl nuclear plant happened on April 26, 1986, due to an explosion in the fourth power-generating unit. As a result of the disaster 19 Russian regions with a total area of about 60,000 square kilometers (23,166 sq. mi.) and a population of 2.6 million people, and 46,500 square kilometers (17,954 sq. mi.) 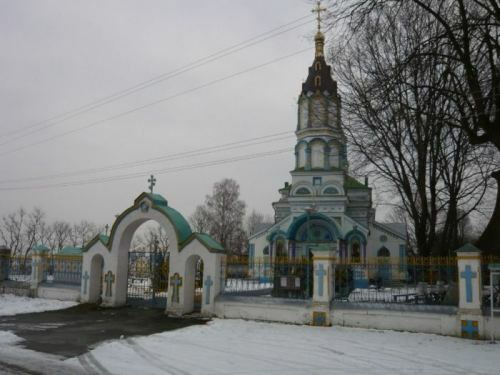 of the neighboring territory of Belarus (23% of its total area) suffered from the radioactive fallout. The overall area of radiation pollution in the Ukraine was 50,000 square kilometers (19,305 sq.mi.) in 12 regions. The icon “The Saviour of Chernobyl,” in Prophet Elijah Church, painted (written) after the disaster, has a unique history. According to the web site of the Church of St. Theodosius in Kiev, the icon’s prototype appeared several times in dreams to Yuri Andreev, an atomic energy worker who received an enormous dosage of radiation at the time of the accident. 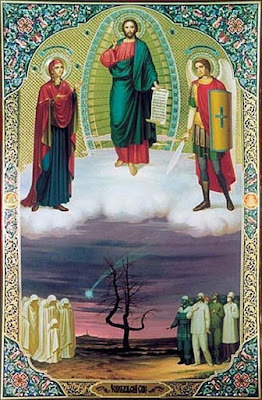 Andreev dismissed the visions as simple dreams, or even heresy, but eventually decided to ask Metropolitan Vladimir of Kiev (now recently-reposed) if it would be possible to have an icon made showing the Saviour, together with the people of Chernobyl who risked or sacrificed their lives to save others from the radiation. Metropolitan Vladimir gave his blessing. The icon depicts The Saviour, the Mother of God, and the Archangel Michael at the top of the icon. At the bottom left are the souls of the victims who died from the accident; on the bottom right are the workers who knowingly stayed in the deadly radiation in order to contain the accident. 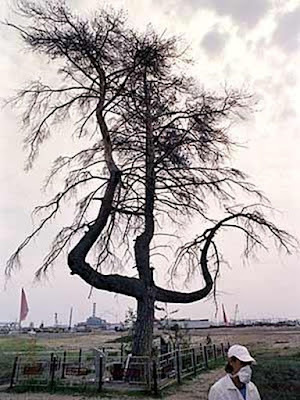 Between them is a pine tree, shaped like a trident, that stood at Chernobyl. “Workers of the Chernobyl nuclear plant were all non-believers,” said Andreev, as reported by The Voice of Russia, “until they witnessed something which can only be interpreted as the power of God. In the very first seconds after the explosion on the fourth reactor a cloud with uranium particles moved towards the neighboring town of Pripyat,” only 1800 meters (1 mile) away. “A pine stood in the way of the radioactive cloud. Before it reached the tree, the cloud broke into two halves and instead of covering the town, it passed it by a mere several meters from residential areas. No one can explain this to this day." During WWII, the pine had been used by fascists to hang Russian soldiers on. 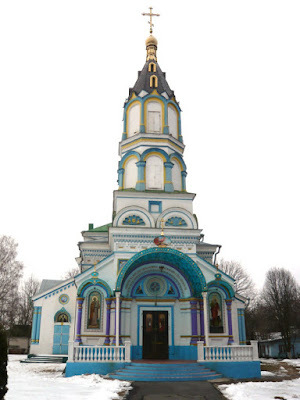 The Icon has been the source of miraculous healings, according to the St. Theodosius Church web-site. 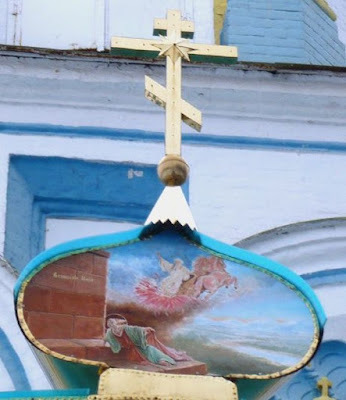 During the consecration of the icon, a miracle occurred witnessed by thousands of people: a dove flew over the icon, a rainbow appeared in the sky in the shape of a halo (though there had been no rain), and then an Orthodox Cross appeared in the sky, with the sun in the center of it. Now the territory adjacent to the church has the background level of 6 microroentgen per hour compared with 18 in Kiev. Andreyev also said many disaster liquidators had been atheists. "We came to believe later after observing such developments, which could be explained only by God's will," he says. "The cloud stopped short of this pine, divided into two parts by some unknown reason and continued moving to the left and right sides of the city instead of covering its residential areas. The radiation level in contamination areas was four or five roentgen per hour, and the city showed only half a milliroentgen," Andreyev said. This icon was painted in the early 21st century in remembrance of the Chernobyl nuclear disaster in 1986. It depicts Jesus Christ the Savior in Heaven, surrounded by a mandorla, with His hand raised in a blessing. Flanking Christ is the Mother of God to His right, supplicating her Son, and the Archangel Michael to His left. A star falls on Chernobyl, reminiscent of the Book of Revelation's reference to "wormwood", which in Ukrainian is translated as "chernobyl". The pine tree that saved the city is depicted in the middle.